Definition - Gluten (from Latin gluten, "glue") is a protein composite found in wheat and related grains, including barley and rye. Gluten gives elasticity to dough, helping it rise and keep its shape and often gives the final product a chewy texture. Gluten is used in cosmetics, hair products, and other dermatological preparations as well. Also sometimes confused with glutinous rice, which is sticky rice. Glutinous in this sense means glue like, not to be mistaken for gluten. This isn't to discuss Celiac disease or whether gluten sensitivity is a real thing or not. We're all bio-individually unique. Chris Kresser does a fine job in Paleo Code to help people decipher their sensitivities beyond gluten. Maybe it's not gluten at all (which is a protein) but FODMAPS, a carb in wheat and most other grains, certain fruits, dairy, legumes, and also in certain vegetables like garlic and artichokes. Coincidentally the majority of these foods, are foods that our ancestors seldom ate. In people's haste to narrow down their health and weight issues to one antagonist (making it one thing is a lot simpler than trying to figure out the complexities of your health), they went gluten-free and jumped from the frying pan into the fire. "NOBODY should be eating gluten-free foods made with cornstarch, rice starch, tapioca starch, or potato starch. These starches in the dried, powdered form provide an exponential increase in surface area for digestion, thereby leading to sky-high blood sugar and all the consequences of extravagant glycation (glucose-modification of proteins), such as diabetes, visceral fat accumulation, hypertension, cataracts, arthritis, low HDL/high triglycerides/increased small LDL particles, heart disease, and cancer. So we don’t replace one problem–modern semi-dwarf wheat–with another problem–gluten-free junk carbohydrates in this dried, pulverized form. This is such an incredible blunder that is growing because, as more people embrace the idea of being gluten-free, they turn to these foods that are now found in most grocery stores. So let’s be absolutely clear: NOBODY should be eating these awful gluten-free foods made with junk carbohydrate ingredients! It may be “organic,” “multigrain,” “sprouted,” “fair trade,” or pink with purple polka dots... gluten-free foods made with cornstarch, rice starch, tapica starch, and potato starch KILL people and no one should eat them!" We've been here before and done this already with great consequences. Before gluten it was fat. Instead of gluten-free, it was fat-free. We based our food pyramid around avoiding fat and loading up on sugar (sugar with gluten). Just like we did with fat, we replaced gluten with a more powerful carb alternative. We seem to always replace with carbs in their more powerful, processed, and GMO form, no matter what ingredient we're replacing. Instead of trying to get off of our carb/sugar addiction, and retooling our eating, we keep carbs as the base and just made it gluten-free. Basically the message is, still avoid fats, and still eat processed grains and carbs, just eat a different kind. Rather than questioning if our health standards are problematic to begin with. It's all reiterations of the low-fat, high-carb chemical nightmare. 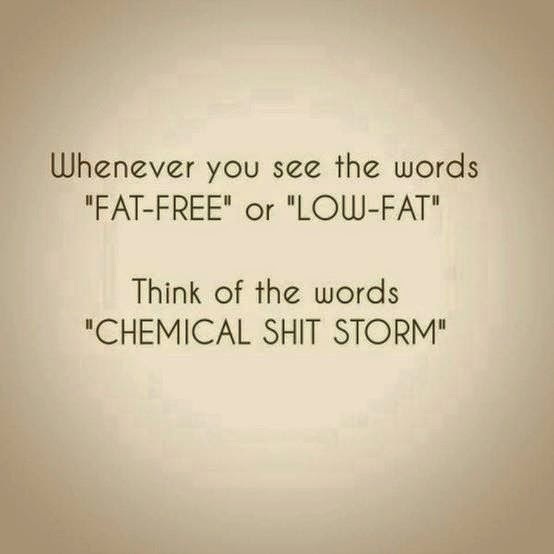 Only processed and packaged foods will say, fat-free, gluten-free, low-fat, low calorie, or vegan. Because it's not apparent. If it's not packaged or processed like a broccoli or asparagus, it's already understood it's fat-free, gluten-free, vegan, and low-calorie. It's the packaged processed stuff we don't know about. When it's 0-calories and it's not pure water or tea, it's a pure chemical artificial concoction. Rather than focusing on nutrition, we focus on eliminating gluten, fats, calories, or animal products. It makes eating easy, as long as it doesn't have any of these things, it by default must be healthy. This is not true, and we're going low nutrition due to this idea. We're expecting food manufacturers to make our health decisions for us. Gluten and fat are just being replaced with sugar along with artificial sweeteners, preservatives, additives, colors, fillers, and other lab made chemicals. We've even replaced fat with organic wood pulp. This keeps us hooked on restaurant foods, pre-made foods, packaged foods, processed foods, fast foods, and basically any food of convenience. It makes us believe we can buy food that's just as healthy as ones we could prepare ourselves. It puts the responsibility of health on the people who make our food, however they define what's healthy for us. Gluten-free blueberry muffins, tofu lasagna, or dry bland chicken breast, which would you pick? They basically made the decision for you as they picked the most tasteless part of the chicken and removed the fat to make it the least appealing. The chicken is also the least profitable food among the three (any sugar, chemical, grain, or legume based food is more profitable). Big Tobacco is considered to be the bad guy, but from conservatives to liberals, junk food lovers to foodies and health nuts, somehow Big Sugar gets an exemption. This sugar is "all-natural" and "organic" and made from "real" fruits, so it's okay the health nuts and intellectuals say. If the health nuts and college educated intellectuals say sugar is okay, then it must be okay, the idea spreads. Even though grains and sugar are the largest part of the American diet. Natural organic things in over-abundance and concentration can still kill us. I mean why eat real foods, when you can just eat junk then juice and take supplements every once in a while right? That's becoming the new "healthy" American way. 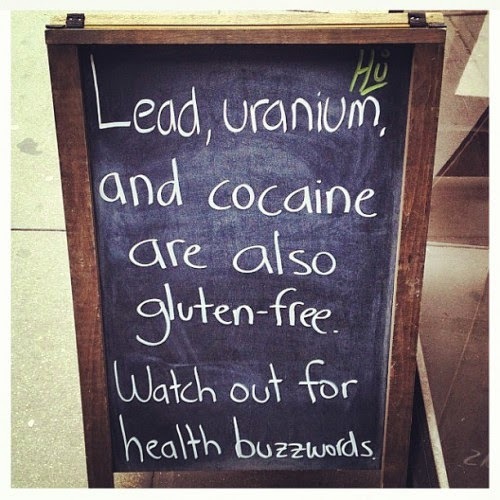 Even people into alternative health are falling in line with this message. They have their own concoctions you can take so you can keep eating junk. Even the terms "natural" and "organic" are up for debate. We still believe we need lots of refined carbs to live. It's just now, not supposed to be from wheat (though there is a lot of push to say, wheat is still good for you, keep eating all refined grains and sugars). It's like we're not allowed to look at sugar as a possible source to the problem, that maybe it's not just wheat, that we eat too much grain products period. Researchers found the problems with FODMAPS in trying to debunk gluten. It revealed that it's not just gluten but most grains and legumes, yet they're still recommended cornerstones of our diets. In our attempts to live a long healthy life, it is not just the food industry we have to watch out for, it's also the health industry with their latest fads, diets, alternatives, and health buzzwords. Don't get seduced.